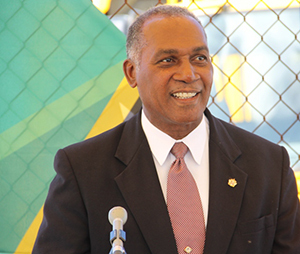 NIA CHARLESTOWN NEVIS (September 25, 2014) — Premier of Nevis Hon. Vance Amory left Nevis on September 25, 2014, to attend a number of official events and meetings in North America in the coming week. In his absence, Deputy Premier Hon. Mark Brantley will serve as Acting Premier. The Premier’s Ministry in the Nevis Island Administration (NIA) issued the statement of his trip on September 25, 2014. “On Friday 26th September, Premier Amory will be holding follow-up meetings in Boston with some individuals, who have expressed an interest in developing a health facility as part of Health Tourism which could be an important new avenue for economic development on Nevis. “This meeting comes as a follow-up to the Invest Caribbean Now seminar which the Premier attended in New York in June of this year,” the statement said. While in Boston, Mr. Amory will also meet with citizens of St. Kitts and Nevis at a town hall meeting in Cambridge at 6:30 p.m. that same evening. The statement further noted that following the engagements in Boston, the Premier will attend other engagements in Canada. “Premier Amory will then go on to Toronto at the invitation of the Consul General of St. Kitts and Nevis to participate in a service to celebrate the 31st Anniversary of the Independence of the Federation of St. Kitts and Nevis on Sunday [September] 28th. “Premier Amory will be one of the speakers at this service which will be held at St. Andrews Scarborough Anglican Church on 2333 Victoria Park Avenue, Toronto, Ontario, Canada,” it said.